I’ve been on a roll with finishing up quilts! Our baby could be arriving this month, so I’m using the nesting urges to my advantage in the sewing room. I’m trying something different today which, if it works, could really simplify this step and make it enjoyable. I just snapped these photos with my phone, used the blogger app and did minimal editing on my photos. Yes, I realize I may be from the Stone Age, I guess I just thought I needed to use my camera. But on to this quilt... I had some leftover 2” squares from another project so I made some four patches. Then I thought they’d be more special set on point. Then some scrappy strips between would be fun... and here’s this warm and bright little quilt, which I quite like. It’s about 40” square. Forcing myself to use my Hope Valley stash, as you can see from the backing! I was laughing with you at the comment about using your phone camera. I forget sometimes to use it, and other times I just immediately snap a few shots. At any rate, you've made something lovely and shared it with us. Given everything else you have surrounding the impending arrival, excellent work. It's a gorgeous baby quilt. My baby was born this month too... although it'll be 11 years ago next week. Oh, this quilt is fantabulous! It looks so soft and cuddly, and scrappy is my all time favorite! I AM a dinosaur. I don’t even have a cell phone. Beautiful! Looks so cozy, and I always love scrappy! I love it, it's beautiful. 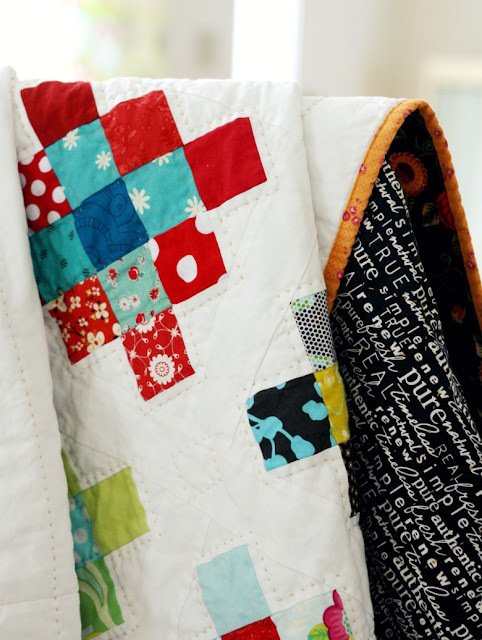 Love to see your quilts--so glad you've found a quicker way to get them on your blog so it's doable for you! Best wishes on the last month of pregnancy and your delivery. What an awesome scrappy quilt! Just love it! I always love seeing your quilt finishes. Such a warm, cozy style. Thanks for the inspiration! I always love to see your new quilts. Always scrappy and beautiful - my favorite kind. Wow good to see your post. It has been a bit since the last one but as someone mentioned, with all you are involved with good for you making some quilty progress! I really like looking at your quilts. What a great, classic design! Good luck with the baby. What do you use as a tie when you do a tie quilt? It seems there are a few options, but I'd love to know what you use! What a great classic design! Thanks for sharing with us..